My journey to financial independence - niterainbow.com: College (University) and private schools as part of the family budget. College (University) and private schools as part of the family budget. 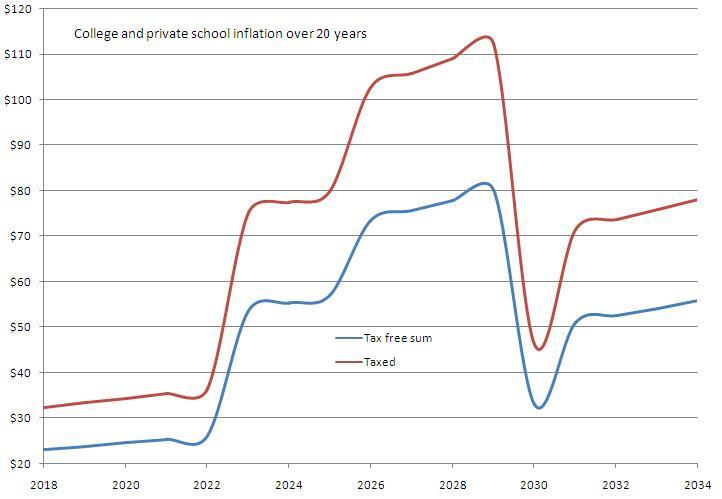 The prices of private schools and college tuition fees are raising, sometimes faster than inflation. Giving an education is not only about competition and survival, but also about freedom of choice for your child. With a degree s/he will have a choice where to go and more time to do other things, enjoy the life. I start wondering is it worth to push ourselves to save more money for a private school and degree, or we will do it on pay as you go basis, i.e. when the time comes we somehow manage it. There is sayings that if you want to make God laugh, tell him about your plans. Nevertheless, I want to understand better what it takes for a family to give kids education. - College tuition fee per annum per person (years 19-22) -$ 30 K assuming 4 years education. - Education inflation fees rate -3% a year. We do know how much does it cost today, this is to mitigate uncertainty of the price increase. - Annual Contribution, this is for the case when you want to save some money and prepare yourself in advance, for purpose of this exercise it is -$40 K a year, no increases. - Tax rate - 40%. This is for the case when you want to use interest on your capital to pay for the college/school. - I assumed that we have some rental income of $12 K a year and rent fee inflation will be 2% a year. - Interest rate received on the invested capital is 4% a year. - Initial investment is $ 250 K in year 2013. In other word from 2012 to 2035 $40 K becomes $15 K at 4% inflation a year, instead of $ 98 K.
On the other hand none of us is guaranteed any returns on our investments, increases in salary which match inflation or even employment. The other assumptions are favorable our parent are savvy, so there is no overlap between kids while studying in college / university (i.e. one kid at a time). Two options are presented annualized money paid taxed (at 40% rate) and not taxed. Aqua color – years at school, olive green in college. Interesting observation is that as value of annual contribution ($40K erodes over period of time) you can almost pay the college fee from your interest, preserving the capital. However most of the people do not have that luxury - saving away enough money from the time when children a born. - If you can push yourself into saving either into 529 plan or ISA Junior. Either of them give you an incredible win, as far as the tax goes. ISA Junior is not that great, as all initial contributions are taxed. - Even if you are one of the rich.. Scenario 1. 529 - College fund. Lets say your first child is born this year and the other will be born in 5 years time (to avoid paying for the college for two at the same time). You need to invest $189 K today at 4% interest with the assumptions mentioned above. At the end of the period you will have none. All of the capital will disappear. Scenario 2. No 529 plan. You will use received interest and pay tax on it at 40% rate, You will end up paying $ 255 K in today's money for it, without investing in the plan. Scenario 2 is less cost effective plan. You need to invest $500 K today and then contribute $40K a year to with non-529 K fund. However you will preserve the principal and will be able to received $33 K a year in today's money, after 30 years, after paying for the college. The only advantage is more security, however when you are one of the rich you have that security. So either or - parents, if you do have kids and want to put them through college. Please use available schemes - 529, Junior ISA, etc. This is plain cost effective measure. Do save, regardless of your abilities, as you will need the money. Do not fool yourself.